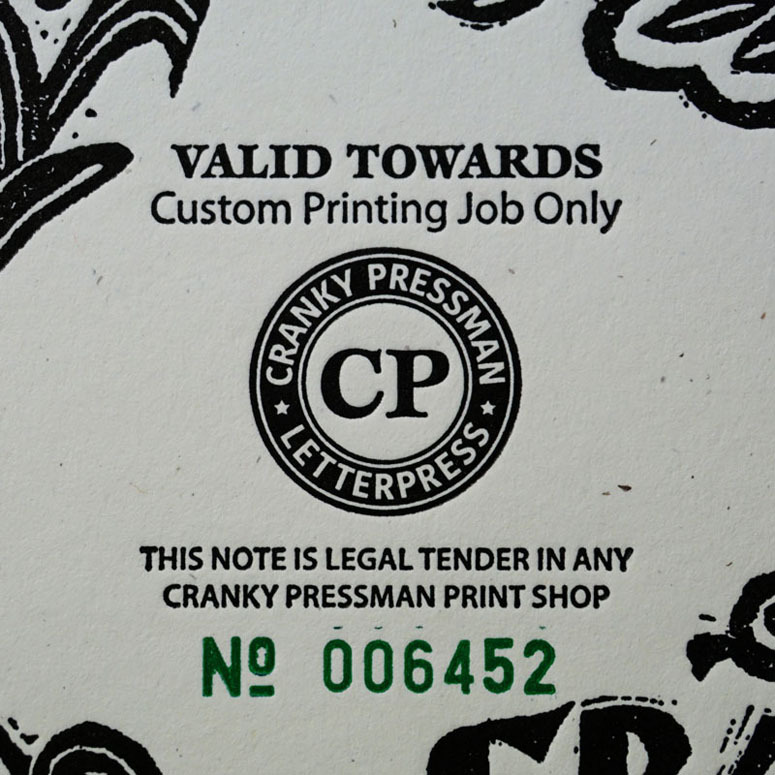 Cranky Pressman is an commercial letterpress printing shop. The crotchety old printer is determined to keep print alive (at least as long as he is). 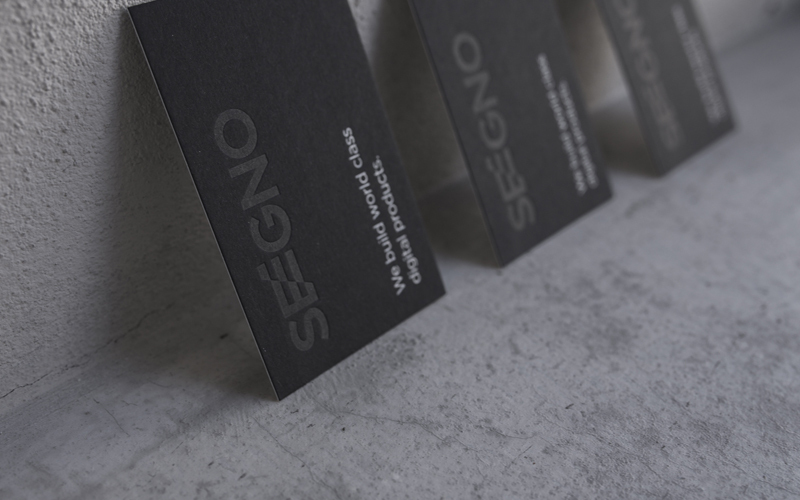 Besides doing the obligatory occasional printed promotion, we also feel that direct mail is an attractive but underused medium. 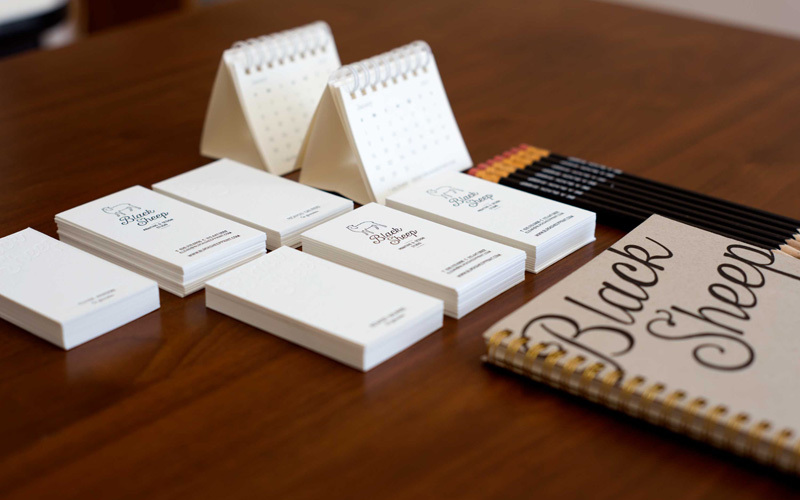 Basically, people like to receive something nice in the mail now and then. The concept behind this piece not only uses print, it is based on an activity only a crafty and accomplished printer can pull off - counterfeiting money. 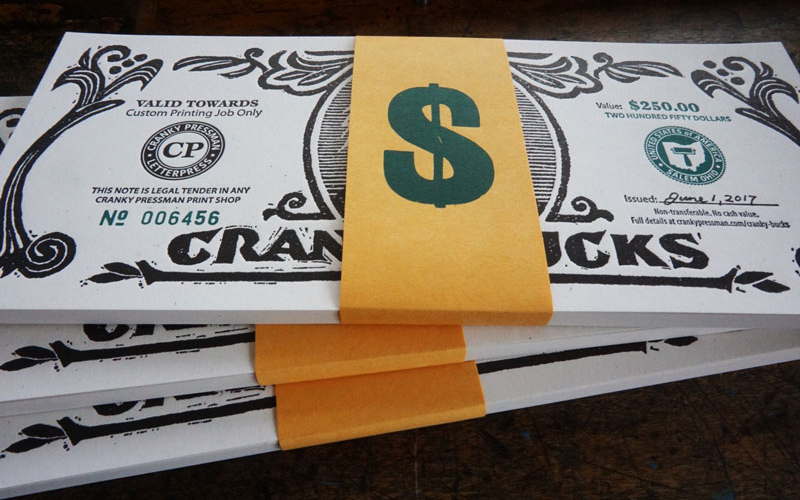 Belly-banded wads of fake money were mailed to graphic design studios, advertising agencies and other creative professionals who make up the printer's key target market. 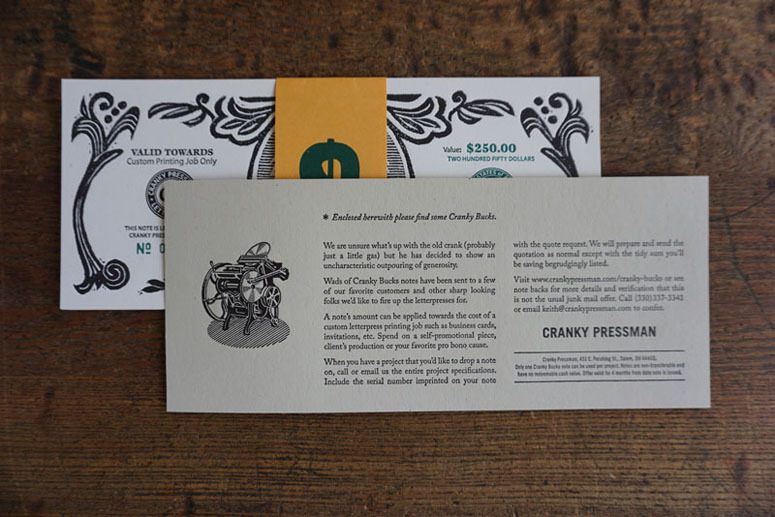 The bank notes can be redeemed as discounts on custom letterpress projects ordered from the shop. 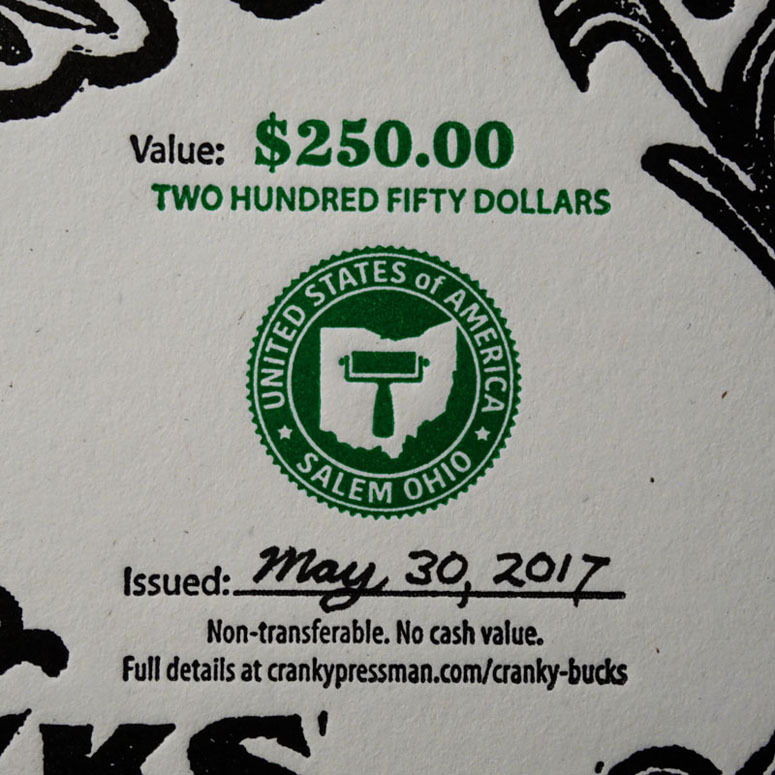 Once the promotion is finished the Cranky Bucks design will be repurposed and used as gift certificates for customers who want to give the gift of print. 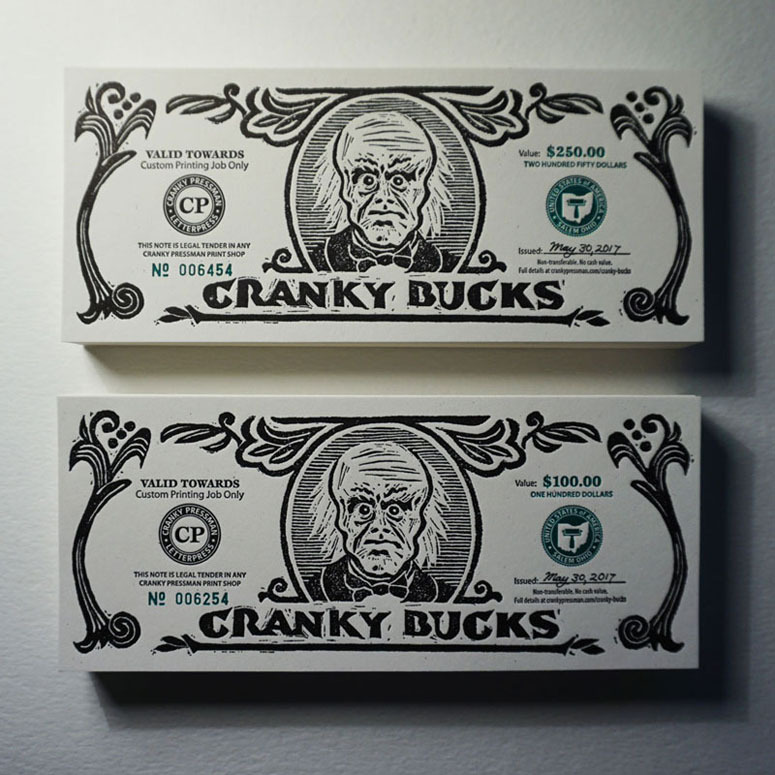 The artwork for the Cranky Bucks notes was first hand-cut in linoleum. 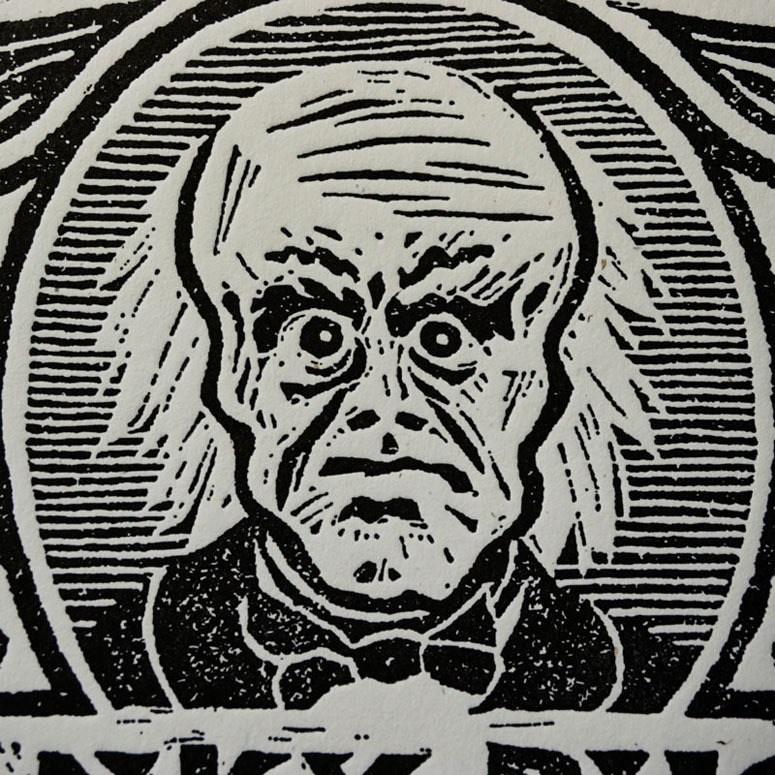 A proof was pulled of the linocut. This was scanned to create the final digital artwork and printing plates. 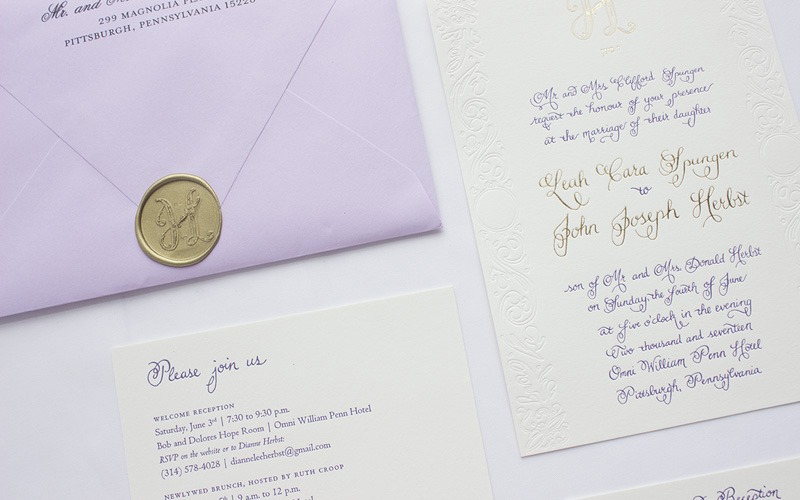 Letterpress printed consecutive numbering was used on each note. As I spend so much time in a old-style printing shop, I recently decided to take up wood and linoleum cutting. 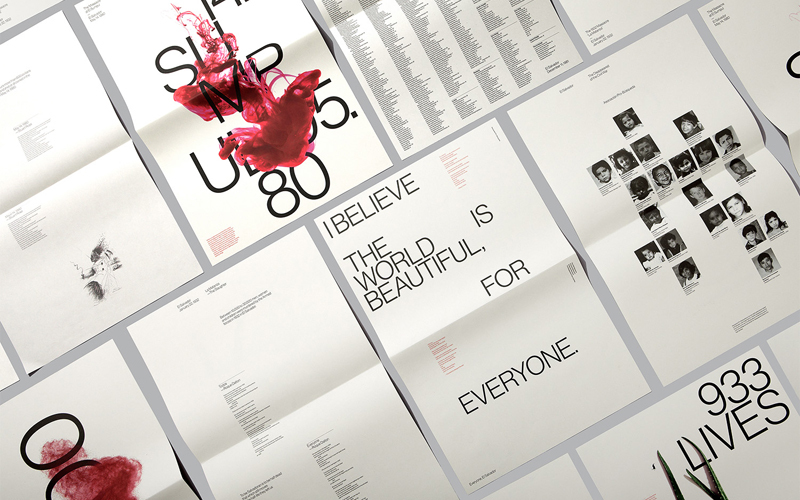 The main graphics and design of the note was hand-cut at 150% of the final size. This allowed me to actually be able to cut the amount of detail with my quite old but inexperienced cutting hands. 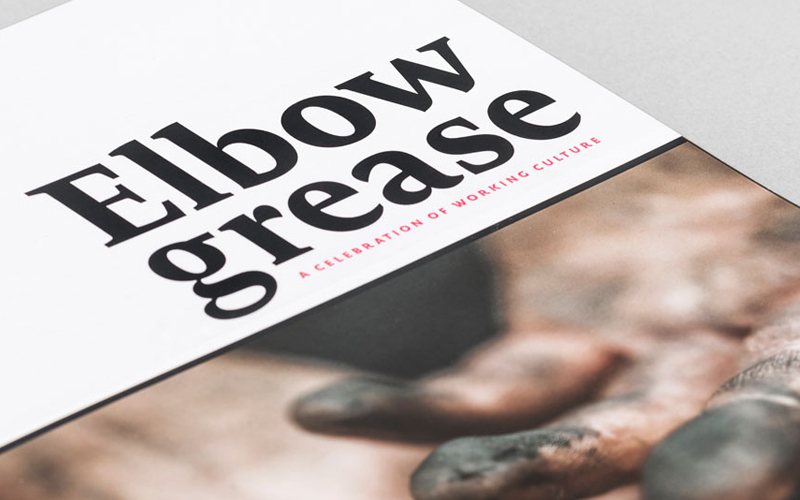 A press proof of the linocut was pulled. This was then scanned and reduced in the digital artwork. Once reproduced at the final size everything tightens up and the details look much finer than they are on the original art. This is an old commercial art trick where you physically had to work at blown-up sizes because there was no other way before the computer came along. Just after the first batch of mailers were produced and mailed I was browsing the web and came across a promotion for The National Stationery Show that also used funny fake money. This was a coincidence and having worked in the business for a long time I can assure you that it is something that occasionally happens. It is part of this life we've chosen. I hope both promotions are a success and were enjoyed by there recipients. 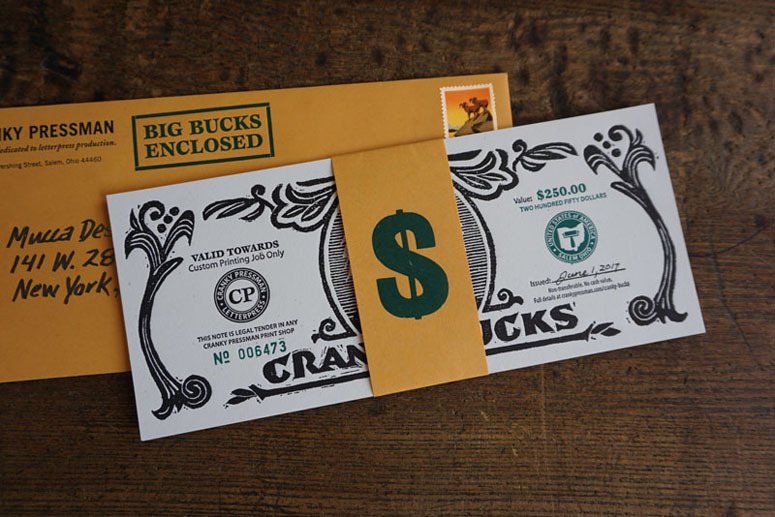 While we don't currently have a letterpress job in the pipeline to put these bucks into use, we have been enjoying them at the office--often paying each other for one thing or another. 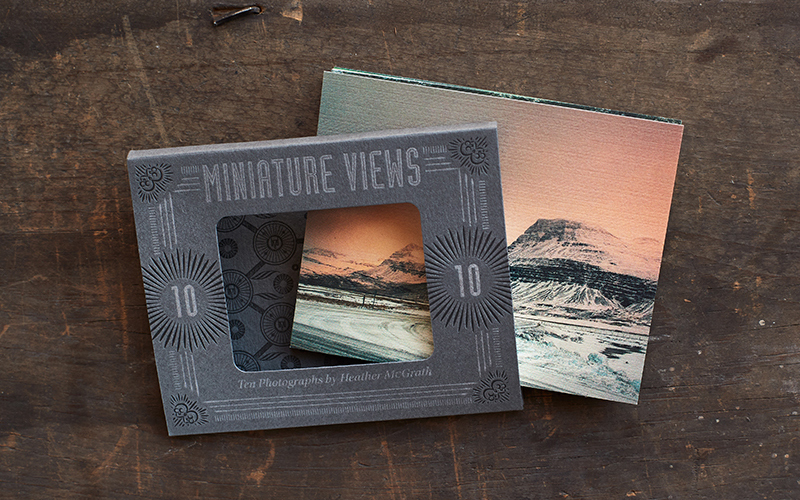 With deep letterpressed groves, these are better than Monopoly money.